Nowadays, with quick construction of society and rapid development of technology, more and more different kinds of steel pipes are created, such as welded steel pipe, seamless steel pipe, ERW steel pipe and so on, and more and more steel pipes are needed. In the competitive market of steel pipe, ERW steel pipe, seamless pipe and welded steel pipe are well sold thanks to their specific characteristics. There are a few aspects of differences between ERW steel pipe and seamless steelpipe. 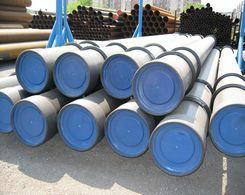 ERW pipe, which is short for electric resistance welding, is used in delivery of liquid, such as fuel, gas and so on, regardless the requirement of pressure, which plays an important role in the conveying tube all over the world, while seamless pipe is a kind of steel pipe shaping square and rectangle and having no seam around with hollow cross-sections, which is used in conveying liquid but also making structural members and machine parts, due to its surprisingly high anti-bending and anti-torque strength and impossibly lightness. All in all, ERW pipe and seamless steel pipe is quite different in use. What's more, the biggest difference between ERW pipe and seamless steel pipe is that ERW pipe has welding line, which is the same as welded steel pipe, but seamless black steel pipe doesn't have, either does the welded steel pipe. Furthermore, the welding line of ERW pipe is the key to the quality of ERW steel pipe. The more unrecognizable the welding line of ERW pipe is, the higher quality ERW pipe has. As an old saying goes ‘hard work pays off', with scientists' continuous hard study, a huge success in eliminating the welding line of ERW pipe has been achieved. There are two ways to eliminate the welding line: geometric seamlessly and physical seamlessly. 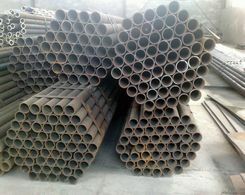 Geometric seamlessly is to eliminate the burr both inside and outside while physical seamlessly is to take steps to make base metal and metallographic structure uniform and consistent, which seems more complicate to achieve, however, a ERW pipe without a welding line can be successfully attained through which. Compared with processing technique of ERW pipe, the processing technique of seamless steel pipe is much simpler. There are two entirely different types of processing technique: cold-drawing and hot rolling. Compared with hot rolling, the technological process of cold-drawing is more complicated. Moreover, in the appearance, cold-drawn seamless stainless steel pipe is shorter than hot-rolled one and the wall thickness of cold-drawn seamless stainless steel pipe is generally smaller than the wall thickness of hot-rolled one. What's more, the technological process of hot rolling needs high temperature which reduces the resistance of deformation so that a big deflection is achieved. Generally speaking, the technological processing of ERW pipe and seamless steel pipe are quite different, due to the different appearance. In general, although ERW pipe and seamless steel pipe both play an important role as well the welded steel pipe do in the construction of society, ERW pipe and seamless API steel pipe has different use and different making progress thanks to their different appearance. Scientists have always been paying a lot to improve their property, which is aimed to make them more multifunctional and to reduce the cost of processing. Maybe one day, ERW pipe and seamless steel pipe will have little differences.